The 56th annual conference of the Western History Association takes place in St. Paul, Minnesota, from October 20-23, 2016. This year the four-day event theme is “Expanding Western Horizons,” with many planned programs focused on public history and on figuring out how the history of the American West fits into popular understandings of the United States and the world. Editor in Chief Larin McLaughlin and Mellon University Press Diversity Fellow/Assistant Editor Niccole Leilanionapae’aina Coggins will be representing the press—be sure to stop by booth #10 to say hello and to check out our latest Western history offerings, especially titles in the Indigenous Confluences series, Scott and Laurie Oki Series in Asian American Studies, and Weyerhaeuser Environmental Books series. University of Washington historian Erasmo Gamboa recounts the difficult conditions, systemic racism, and decades-long quest for justice faced by the workers of the bracero railroad program. The result is a pathbreaking examination that deepens our understanding of Mexican American, immigration, and labor histories in the twentieth-century U.S. West. Read an excerpt about box car housing for the program. Read an excerpt about how women in Mexico acted on behalf of their loved ones working temporarily in the United States. October 2016 marks the 50th anniversary of the Black Panther Party’s founding. Combining histories of the city and its African American community with interviews with former Portland Panthers and other key players, this long-overdue account adds complexity to our understanding of the protracted civil rights movement throughout the Pacific Northwest. A compelling study of a previously overlooked vice industry explores the larger structural forces that led to the growth of prostitution in Japan, the Pacific region, and the North American West at the turn of the twentieth century. A fascinating look at early American boxing, Counterpunch examines how the sport’s meteoric rise in popularity in the West ran concurrently with a growing backlash among Progressive Era social reformers who saw boxing as barbaric. It provides an entertaining way to understand both the growth of the American West and the history of this popular and controversial sport. Matthew Sakiestewa Gilbert is chairing a session on Histories of Indigenous Education including panelist Kevin Whalen on Sunday, October 23 (full details on page 35 of the conference program). Native Students at Work tells the stories of Native people from around the American Southwest who participated in labor programs at Sherman Institute, a federal Indian boarding school in Riverside, California. By William J. Bauer Jr. Using oral histories of Concow, Pomo, and Paiute workers, taken as part of a New Deal federal works project, Bauer reveals how Native peoples have experienced and interpreted the history of the land we now call California. A groundbreaking examination that contributes to Native American, Western, and education histories, as well as to borderland and Southwest studies. This entry was posted in Conference Preview, History, Latino/a Studies, Native American and Indigenous Studies, Pacific Northwest, Reviews, Western History and tagged Bracero Railroaders, California through Native Eyes, Counterpunch, Education at the Edge of Empire, Emil and Kathleen Sick Book Series in Western History and Biography, Indigenous Confluences, Japanese Prostitutes in the North American West, Native Students at Work, The Portland Black Panthers on October 12, 2016 by uwpressblog. Congratulations to David B. Williams, winner of the 2016 Association of King County Historical Organizations (AKCHO) Virginia Marie Folkins Award for Too High and Too Steep. The awards event will be held on Tuesday, June 7, 5:30-8:30 p.m., at the Northwest African American Museum. Read more at the AKCHO site. The PBS series 10 Parks That Changed America, featuring Gas Works Park and interviews with Richard Haag and The Landscape Architecture of Richard Haag author Thaisa Way, will air on Tuesday, April 12. Watch the preview and select clips now. This entry was posted in Anthropology, Art and Art History, Asian Art, Asian Studies, Current Events, Environmental History, Events, Gender Studies, History, Japan, Nature, News, Pacific Northwest, Reviews, Southeast Asia, US History, UW Press News, Western History and tagged A Chemehuevi Song, A Landscape of Travel, Alaska's Skyboys, Asians in Colorado, Bike Battles, Chinookan Peoples of the Lower Columbia, Counterpunch, Heroines of the Qing, Idaho's Place, Japanese Prostitutes in the North American West, Mekong Kids, On Cold Mountain, Power Interrupted, Radical Theatrics, Seeing Nature, Sensitive Space, Silkworm Books, The Afterlife of Sai Baba, The Gender of Caste, The Landscape Architecture of Richard Haag, The Letter to Ren An and Sima Qian's Legacy, The Portland Black Panthers, Too High and Too Steep, Walking Washington's History, Warnings against Myself on April 6, 2016 by uwpressblog. 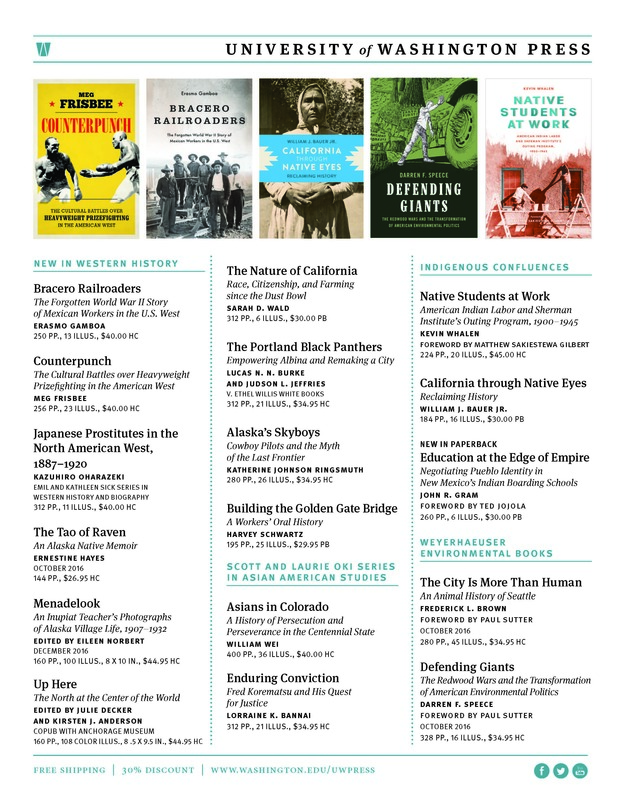 The Organization of American Historians heads to Providence, Rhode Island from April 7-10 and we will be debuting and previewing a number of new history titles across sub-fields including American and transnational history, African American studies, Asian American studies, Native American and Indigenous studies, and more. Stop by booth #524 if you are attending the meeting to see our full range of titles and to meet Editor in Chief Larin McLaughlin and Senior Acquisitions Editor Ranjit Arab. Use the #OAH2016 hashtag to follow along with the conference on social media. Using oral histories of Concow, Pomo, and Paiute workers, taken as part of a New Deal federal works project, this innovative book reveals how Native peoples have experienced and interpreted the history of the land we now call California. The result both challenges the “California story” and enriches it with new voices and important points of view, serving as a model for understanding Native historical perspectives in other regions. For the first time, historian Kevin Whalen reveals the challenges of Native people from around the American Southwest who participated in labor “outing programs” at Sherman Institute, a federal Indian boarding school in Riverside, California. Despite cruel working conditions, young Native men and women used the outing program to their advantage whenever they could, forming urban indigenous communities and sharing money and knowledge gained in the city with those back home. This entry was posted in African American Studies, Asian American Studies, Conference Preview, Gender Studies, History, Native American and Indigenous Studies, Sexuality Studies, US History, Visual Studies, Western History, Women's Studies and tagged Alaska's Skyboys, Asians in Colorado, Black Women in Sequence, Building the Golden Gate Bridge, California through Native Eyes, Counterpunch, Enduring Conviction, Indigenous Confluences, Japanese Prostitutes in the North American West, Native Students at Work, Stars for Freedom, The Portland Black Panthers on April 5, 2016 by uwpressblog.